Mention Vilas and Oneida County, Wis., to an ice fisherman, and he's likely to think, "walleye," or "crappie." But, when the weather turns bitter cold, Oneida County fishing guide Greg Bohn thinks of another species that's often overlooked - nice yellow perch. "People typically come here for tip-up or tip-down walleyes," said Bohn. Those that don't, fish the hard water for bluegill and crappie. "But, we have very, very nice perch that have gone unnoticed for years." Wisconsin perch are being discovered as restrictions on perch are tightened in other states better known as winter perch destinations, such as Minnesota or the Dakotas. Perch in those places I agree may be bigger on average. But Wisconsin perch average 8.5 to 11 inches, and you can harvest 25 of them each day. That ain't all bad! Perch here are plentiful and according to Bohn, could use some angler pressure. Add crappies many up to 13 inches and a few nice big bluegills to the 25-a-day panfish limit and you have an ice angler's dream. 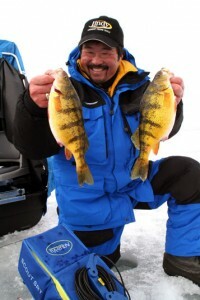 Perhaps the hardest thing about perch fishing through the ice is finding them. Narrow the scope of the search by stopping at bait shops to ask for the latest information on where perch are biting. "If they mention a particular lake, you're ahead of the game," Bohn said. Be specific when asking lake questions and perch locations, as hundreds of lake choices are available. In Vilas County and neighboring Oneida County, expect to hear names like Big Arbor Vitae, Carrol, Big St. Germain, Minocqua and North & South Twin Lakes. "Those would be good choices to get started," he said. Once you arrive, watch for other perch anglers. This can be a good indicator on where perch schools are roaming on any given day. Stay on the outside of any perch pack and be advised; "Perch move a lot," Bohn said. "They will eat everything in sight and move on. You might catch a bunch in one area one day and go back the next and not catch a one." The lesson in that bit of wisdom is this - to find perch, you must stay on the move, too. Use portable ice shanties like the Fish Trap designed by Dave Genz. Bohn focuses on two basic patterns. One concentrates on shallow perch working the remaining green weeds. The other centers on deep water, usually mud flats and deeper holes. Early winter and weeds perch may be their eating small leeches and insect larvae. In deep water, they are probably focusing on microscopic zooplankton or mayfly larvae known as "wigglers." If fish aren't in one of those places, they will probably be in the other. Start by checking for shallow weed fish first. Check weed patches on the edges of bars or dropoffs on the edges of flats. Those locations can produce all winter and become overlooked in exchange for deeper water areas. Perch will migrate along the sides or over the tops of the weed patches. Some larger crappie size minnows help to eliminate small perch! Drill lots of holes and fish each one. It's often impossible to see these fish on the flasher because they can stay so tight to the bottom or in the vegetation. You can't tell if fish are there unless you drop your bait down to see. An underwater camera like an Aqua-Vu can do the trick, too. "It's a mistake not to put a minnow or a waxie or a wiggler down the hole. I can't tell you how many times I've limited my fishing, by not searching," he said. Searching with the Vexilar Flasher might work for bluegill, but don't be fooled into thinking perch are not available. If no fish are biting after a few minutes, head for deeper water. Depending on the lake, deeper water can mean 20, 40 even 60 feet. Fish go deeper and water temperature drops until they start to move shallower again in late February while preparing to spawn on sandy bottoms. Perch are the first species to reproduce each year. Look for deep mud flats off the tips of points. Bohn uses the newer model Vexilar FL-18 package with the zoom feature. He can concentrate on the area closest to the bottom where the fish are. In low-light conditions at sunrise, a band of zooplankton often clutters the view of the bottom as they emerge from the mud. That's a good sign. Perch won't be far away. They love that stuff. Bohn also likes the Aqua-Vu SV-100 and Aqua-Vu Scout SRT, which features Spectral Response lighting. Bohn seems to think that attracts zooplankton beneath his hole and jigging area. An accessory Ice Pod Stand will keep the camera lens out of the mud. Bohn uses two different set-ups depending on the presentation he wants to use. For jigging, Bohn likes the Dave Genz rod series in 28- and 30-inches. He uses 4-pound Stren Magnathin, which has the diameter of 3-pound test. Helps hold onto the occasional walleye bite. One of his favorite baits is a Nil's Master spoon, a narrow spoon that has a short chain for added flash and action. Bohn also uses size zero or size 1 Swedish Pimples. Another good choice is a size 1 System Rattl'r or a small #6 Genz Worm. Try the new Techni-Glo colors, especially in times of low-light. When do these Glo color patterns work-all day! Try adding a split shot a few inches above the jig in order to get the bait down quickly to avoid wasted time. Add three of four "spikes," wigglers or two waxies for action, smell and taste of natural bait. When fishing for perch, it is critical that the bait is alive. For finesse fishing, Bohn turns to a shorter ice rod of 18 or 24 inches still-fished in a second hole. He adds a spring bobber to the tip, and then pastes a glow bead on it to make light strikes easier to see. Add a Thill Pro-Series Float PS105 or PSW105 (Weighted) designed by Greg rigged as a slip float for super light bites and for minnows. The new Pro Series Floats are getting huge acceptance from ice anglers across the Midwest. With a crappie-sized minnow, use a split shot, hook or ice jig. Hook the minnow near the tail. This increases the action and perch like to take the minnows headfirst. If the minnow tires, simply pick up the rod and jiggle it; that often wakes the minnow up and provokes a quick strike. Don't be surprised if you take a bonus walleye or two. Perch action is good all the way to ice-out in late March. There have been years when Bohn is still on the ice April Fool's Day. Next time you think about Vilas and Oneida County, Wis., don't automatically think of walleyes. Think perch. Bohn enjoys the day with his clients, having a cookout right on the ice. He provides everything you need and all you have to do is show up. Strictly Walleye Websitewww.gregbohn.com Phone him at (715) 356-4633.